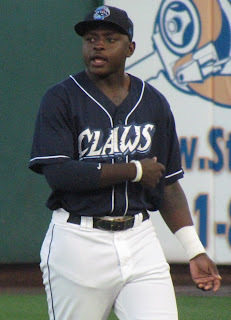 Upon being selected with the 10th overall selection in the 2015 MLB amateur draft, outfielder C. Randolph quickly placed among the Phillies' top ranked prospects. As an 18-year-old, Randolph had a tremendous professional debut in 2015, posting a .302/.425/.442 slash line in 53 games for the rookie level Gulf Coast League Phillies. In 2016 as a member of the Class A Lakewood BlueClaws, Randolph would tally a .274 average with two homers and 27 RBI in 63 games. The youngster missed more than two months of action with an injury (muscle strain in back/shoulder blade area) from April to June, but he finished the season healthy. He spent time during the following off-season working with a strength coach as well as former big league outfielder Mike Cameron at his training center in Georgia. Last year as a member of the Class A Advanced Clearwater Threshers, Randolph sported a .250 batting average with 13 home runs and 55 RBI in 122 games. The Florida State League gave Randolph the kind of challenge the Phillies had hoped for. He improved month to month, seeing his batting average rise a great deal with each turn of the calendar until he cooled off in August. Over the off-season, Randolph played in the prestigious Arizona Fall League. In 19 games with Glendale, the 20-year-old batted .239 with four doubles, a triple and eight RBI. Speed wise, Randolph can be quick but with just 20 steals in 33 attempts in his professional career to date, he doesn't appear to be a runner that will strike fear into opposing batteries as a notable threat. It's likely that Randolph will see some time at the Double-A level with Reading this year. If his offensive game progresses the way the Phillies have hoped it will, he's got an estimated time of arrival in the big leagues that is still a couple seasons away.